Google started to show a special OneBox for the FIFA World Cup, the international football tournament that will start Friday in South Africa. 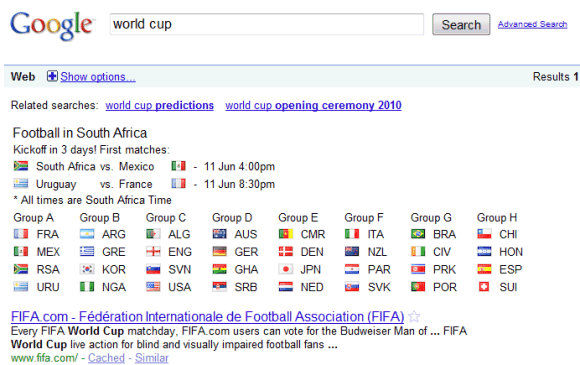 If you search for "world cup", you can see a list of the teams and the upcoming matches. At the bottom of the page, Google replaced "Goooooooooogle" with "Gooooooooooal! ", at least for the first page of search results. Google Street View is now available for South Africa and you can see the 10 World Cup stadiums in a gallery. Google Earth links to 3D models of the stadiums and the 9 cities that host the World Cup. How come you still don't have a "tweet this" button on this blog. I find so many interesting things about Google here that I want to share with others. Now copy+paste this url to is.gd, then copy+paste to twitter is more complicated that a simple "Tweet this" button.